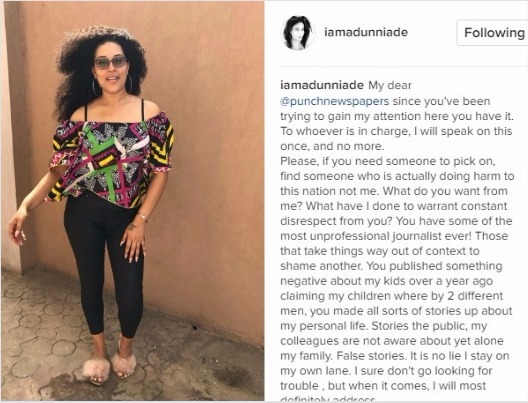 The actress who was in the news recently after she and her cute boys covered the latest issue of the Motherhood Magazine has called out Ace newspaper for allegedly publishing fake stories about her life, her children and disrespecting her. My dear @Punchnewspapers since you've been trying to gain my attention here you have it. To whoever is in charge, I will speak on this once, and no more. Please, if you need someone to pick on, find someone who is actually doing harm to this nation not me. What do you want from me? What have I done to warrant constant disrespect from you? You have some of the most unprofessional journalist ever! Those that take things way out of context to shame another. You published something negative about my kids over a year ago claiming my children where by 2 different men, you made all sorts of stories up about my personal life. Stories the public, my colleagues are not aware about yet alone my family. False stories. It is no lie I stay on my own lane. I sure don't go looking for trouble , but when it comes, I will most definitely address. Now to the matter, you reached out severely in the past 2 weeks requesting for an interview, I told your rep I was on set and had to rush off the phone. Another contacted me few days ago, requesting to know what I was up to, I politely declined an interview because I don't have anything I'd like to share. 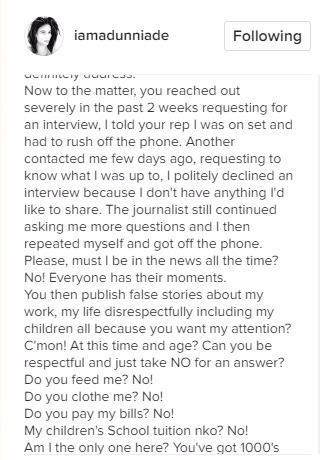 The journalist still continued asking me more questions and I then repeated myself and got off the phone. Please, must I be in the news all the time? No! Everyone has their moments. You then publish false stories about my work, my life disrespectfully including my children all because you want my attention? C'mon! At this time and age? Can you be respectful and just take NO for an answer? Do you feed me? No! Do you clothe me? No! Do you pay my bills? No! My children's School tuition nko? No! Am I the only one here? You've got 1000's of public figures who would love to be featured in your paper. I am in no way, shape or form bragging but I am one of the kindest, warm people you would ever meet and receive others with open arms. C'mon, find another fabricated story to write my dear! I have taken my time out to write this as this is the 3rd time you've been disrespectful towards me as a human being, my brand and children. No more! Go bully someone else!